"We are the world's largest independent Bitcoin news source. Without the ad revenue we would have to either shut down CCN, or get some large investors with their own agenda. If you do not want to support CCN, please do not read our news. If you want to subscribe to a monthly premium CCN service, please contact David Parker (david.parker at cryptocoinsnews.com)." CCN have an established history of promoting scams run by Josh Garza, the con artist behind schemes such as GAW Miners and more recently, Hashcoin. Hashcoin, which is currently advertised by CCN, will begin its initial coin offering in 11 days and has been marketed using the typical subterfuge associated with Garza and co. As evidenced by Garza flying around in chartered jets, many readers are falling for the scam but is it also possible that they are now responding by blocking the advertisements, sparking CCN's demands for them to stop and just get scammed already? The use of adblocking software also goes beyond blocking ads given an increase in the trend for publishers to distribute malware/ransomware via ad networks. 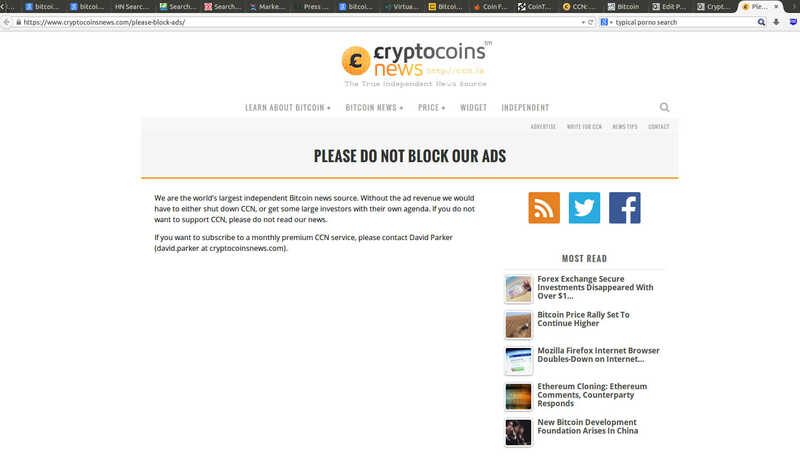 While this is sometimes done unknowingly, why would a reader whitelist a website such as CCN which is known to run advertisements from confirmed scammers? This entry was posted in Commentary, Fraud, Scams. Bookmark the permalink. "Sorry" Probably will see several more redacted stories in the long run, I am afraid. Great find. At the very least they redact instead of "depublish" (but maybe they do that too; I wouldn't put it past them). Interesting. This begs the question: Would you pay for their content, if there was an alternative?